I've done this loop hike before, but often times I've just gone to Thomas Mountain when I'm looking for an hour long hike. 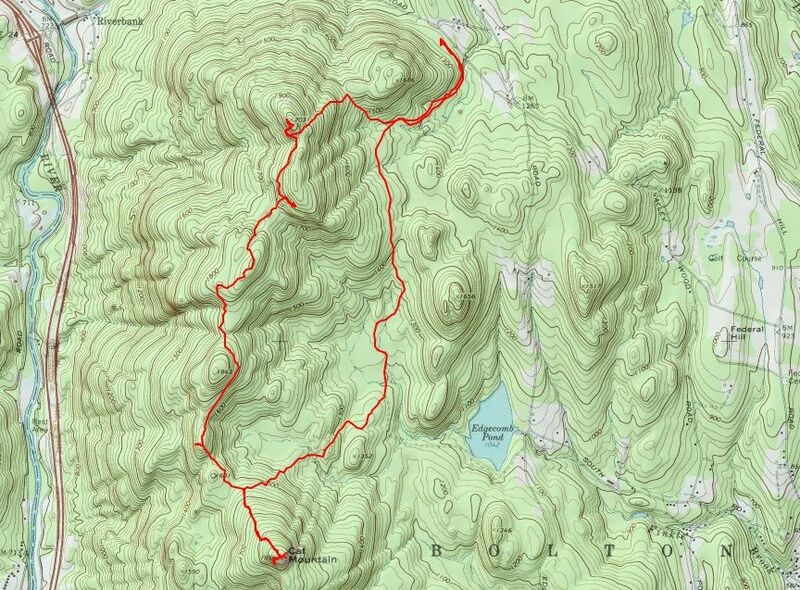 This time Leesa and I did the loop hike of Cat and Thomas Mountains. We went clockwise hitting Cat Mountain first, then took the blue trail to Thomas. The hike to Cat Mountain is 3.4 miles and mostly follows an old jeep road. The last steep section has been re-routed into the woods, which is a nice improvement. It took as about an hour and twenty minutes to reach Cat. It felt quite a bit warmer on the open summit than it did in the shady woods. There was a perfect breeze out and the day was really comfortable. We lunched on the summit and did a little exploring. We did notice a white blaze trail heading south from the summit, and a red blaze trail heading east. I suspect these are older trails and may not be used any more, although the paint didn't look that old. We didn't follow them to see where they went. Cat probably provides the best view of Lake George from the west. You can see the Tongue Range, the islands of the Narrows, and everything heading south from there. It really is a great viewpoint. When we left the summit of Cat Mountain, we took the blue trail that winds along the ridge back to Thomas Mountain. This trail is pretty rugged and I would not recommend it to folks that don't do much hiking. There is one small viewpoint along the way, but Cat Mountain is the best. As we got to Thomas, there were a group of folks enjoying the view from the cabin. We chatted with them for a few minutes before we left. Thomas has a great view also (see my earlier post on Thomas). We stayed at the cabin a few minutes longer and then we took the blue trail the rest of the way down instead of the orange trail (jeep road).